When I told Austin that we were going on the Cliff Walk in Newport, RI, his first question was, “will we be tethered or will we be free falling?” in a completely nonchalant voice that only a ten-year-old boy could manage. No, I assured him, it wouldn’t be dangerous, although the name did capture my imagination in a similar fashion. (I also had envisioned a trail on large precipices plummeting into the Atlantic.) I had wanted to go to Newport to experience the much-touted walk for a couple of years. Now, we could find out just how steep the cliffs were. Planning a day trip for me entails just a bit more effort than a hike that is closer to home. I like to do a bit of research before I go; so, I read up on the trip in Outdoors with Kids Boston and also checked the web for other bits of information. It’s nice to know if there are any good restaurants or other places of interest in case the intended trip goes awry and plans need to change. After finding a family-friendly restaurant, reviewing the trail map and Newport area, I packed trail lunches, snacks, and water in my daypack. We were off by late morning. Because it was the off-season, my favorite time of year to go to any area popular with tourists, we found parking along the road next to the beach (metered parking spots conveniently accepted credit cards). It was then just a short walk to the start of the Cliff Walk. I figured we would need three hours, or more accurately, that Olivia wouldn’t last longer than that. The vivid caution sign made us think that maybe it was the slightly dangerous walk that Austin and I had imagined. However, after about a quarter mile on the nicely paved and manicured trail we realized that it was quite tame. Even so, be sure to stay on the trail as the drop in some places is as much as 70 feet. 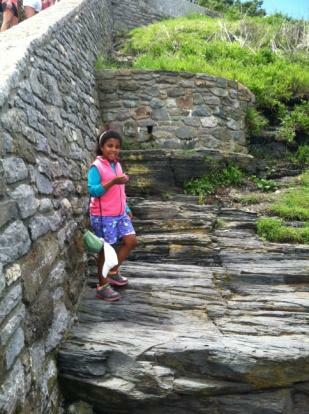 Our first stopping point was at the forty steps, which lead down to the ocean. In the past, this area served as a gathering place for the workers in the mansions, and still has that relaxing vibe. 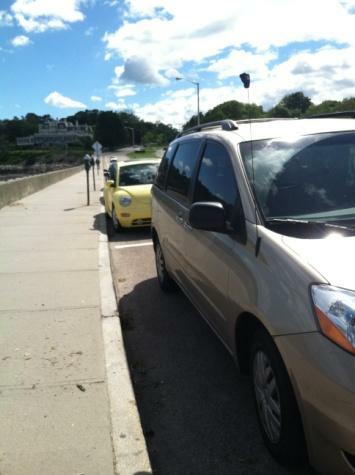 It is the start or end of the walk for people who parked their cars on Narragansett Street, a place to sit and watch the ocean or a welcome respite for those who need a port-o-john. We walked a bit further to a quieter spot to enjoy our lunch. 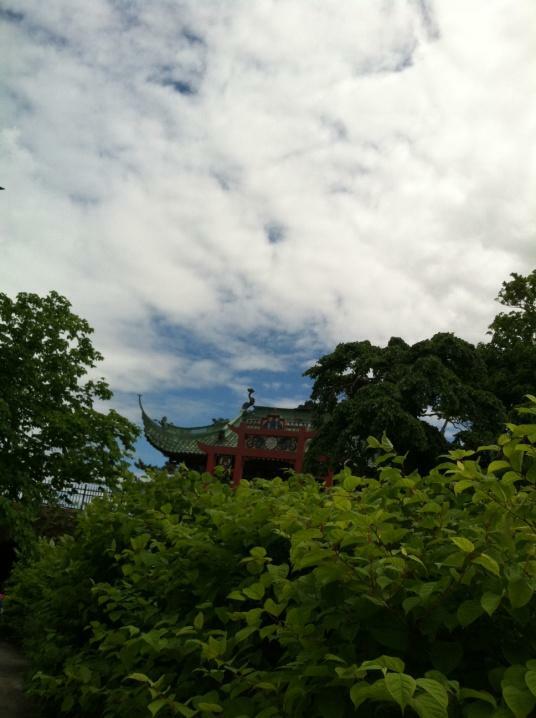 Continuing on, we were in awe of the grandness of the “cottages.” From the path we could only see the top part of our favorite structure, the Chinese teahouse. But surprisingly, we were led under the tea house through a tunnel! 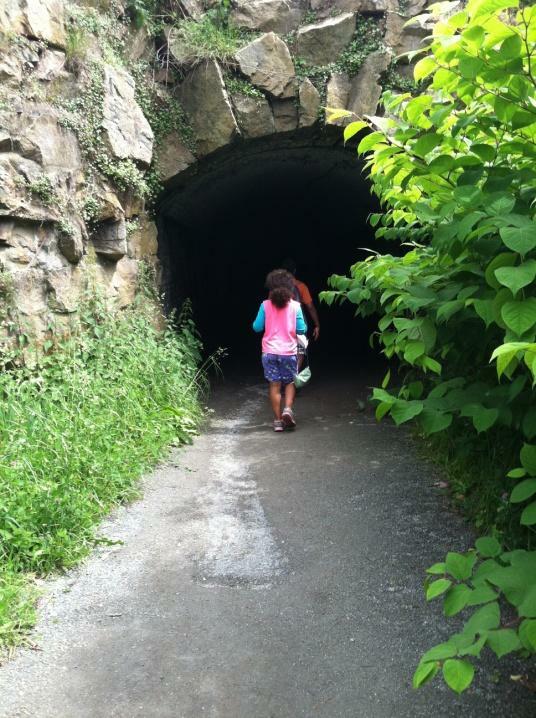 Dark, muddy, and unbelievably long, the tunnel was Austin and Olivia’s favorite part of the walk. In the distance we saw another tunnel. Of course we couldn’t resist continuing on! After going a bit further, and checking out the tidal pools and interesting rock formations, we all agreed that it would be best if we turned back. My intention was to do the entire 7-mile round trip walk but we didn’t want our respective “meters” running out. 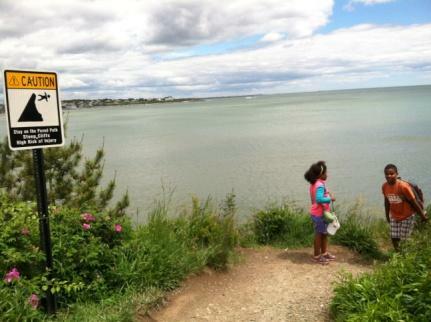 AMC’s Outdoors with Kids Boston guidebook recommends Cliff Walk for parents with children as young as 0-4, with its oceanside promenade, spectacular views, and swimming opportunities. 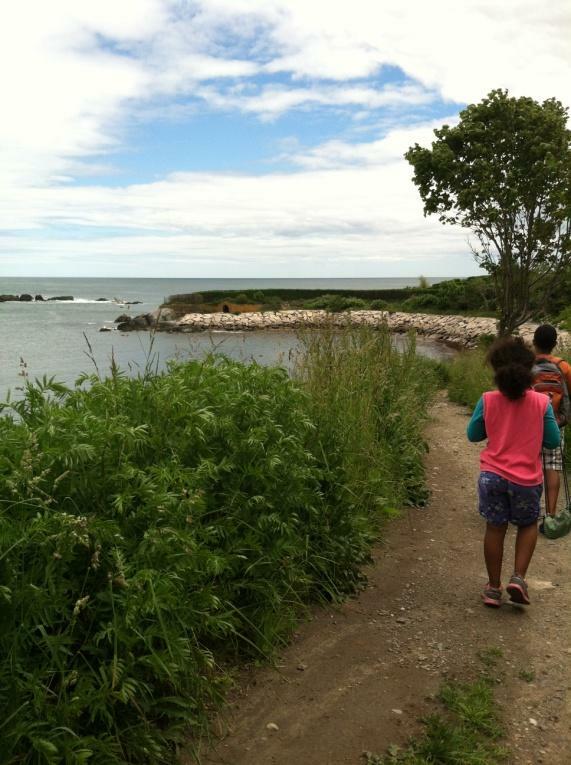 You’ll find more helpful information on this trip at Kids Outdoors Boston—and if you’ve been on the Cliff Walk, be sure to rate your experience and share a photo or two! 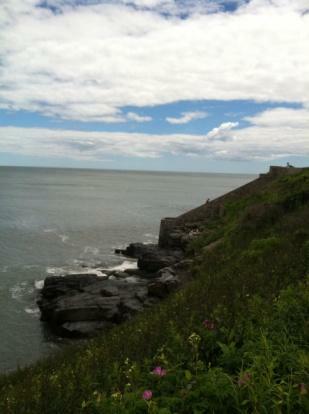 Cliff Walk is open every day from dawn to dusk. 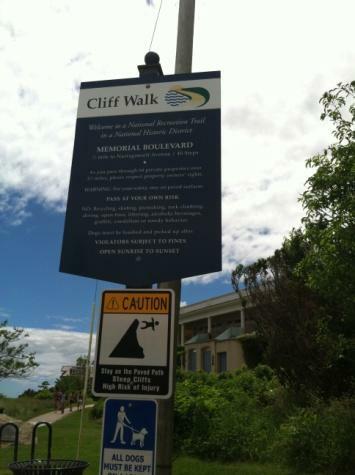 Before your trip, you can check out a map with points of interest at: http://cliffwalk.com/. About the blogger: Andrea Pelosi is a featured guest blogger as part of AMC’s Kids Outdoors Boston Parent Ambassador program, which partners with local parents to share their outdoor experiences with this online community and beyond. Andrea lives south of Boston inside I-95 and enjoys exploring outdoors with her 10-year-old son and 7-year-old daughter. 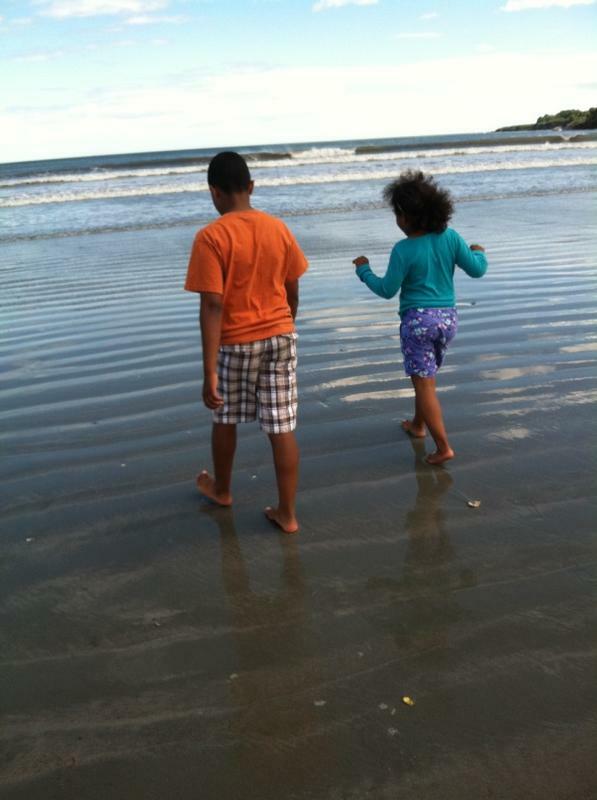 Stay tuned throughout the summer for monthly blog posts and trip reports from Andrea, as well as from other local Parent Ambassadors and AMC’s Outdoors with Kids Boston author, Kim Foley MacKinnon. When hiking with kids, it’s always good to have a payoff to reward their effort, whether you’re offering a mountain view or a chocolate bar from your backpack—or maybe both.